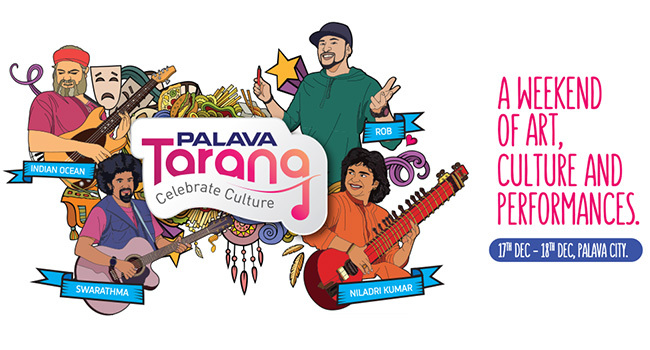 December 2016 Brings to You Palava’s Biggest Art and Cultural Festival, Tarang! Palava Tarang is the city’s cultural festival that brings together some of the most renowned names from the field of art, music, and theater together to Palava. It keeps in mind the city`s vision of promoting various arts and culture initiatives. ‘Palava Tarang’, the festival that celebrates performing arts and culture began in 2015. Last year the event showcased maestros of music, dance, and theatre. The event took place over a period of four weeks and it explored the diverse art forms from across India. Artists such as Padmavibushan Hariprasad Chaurasia and Padmashri Ustad Rashid Khan enlivened the Palava Amphitheatre with their soulful performances. This year things are a little different at Tarang 2016. The lineup this year includes the Indie rock band Indian Ocean, who are widely regarded as one of India’s foremost indie-rock band along with the folk-rock band Swarathma, who are known to leave the audience enthralled. The show also brings to you one of India’s finest sitarist Niladri Kumar. As we see a day of incredible performances from some of India`s best-known artists we also see an entire day dedicated to the young ones in the family. To get your kids in a creative mood we have Rob, India’s biggest and most popular kids’ icon conducting his workshop ‘Mad Stuff With Rob’. Meanwhile, to bring back your childhood memories we have an enchanting retelling of Alice in Wonderland in the form of ‘Dastan Alice Ki’. We end the day on a happy note as Story Circus performs Tik Tak Tales, it’s fun Hinglish play which can be enjoyed by people across all age groups. So, come along to celebrate art, music and our vibrant culture at Tarang 2016. Book your tickets now on bit.ly/Tarang-2016 to have a memorable weekend!